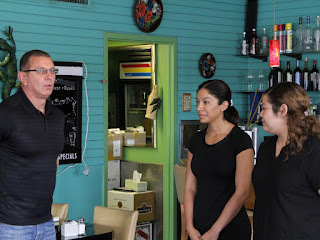 Chef Robert Irvine visits Poco's on the Boulevard in Kansas City, Missouri, to help save an authentic Latin family restaurant run by Claudia and Dana, who took over the restaurant following the death of their mother, just a few months ago. The food shows no consistency and the staff show no respect to the daughters. Robert overhauled both the menu and the decor of the restaurant. When Robert checks in with them a few months later, sales are up $20,000 a month. Claudia reports that the customers are happy with the new changes with the menu and decor. They added some of the old customer favourites back to the menu but also kept Roberts additions alongside these. Trip Advisor and Yelp reviews after Robert's visit were mostly very positive. The restaurant has moved from it's previous location to a smaller premises in March 2015 due to a rent increase but was open for just 5 months before closing in August 2015. This episode was episode 1 of season 5 and was aired on November 21 2012, there were 13 episodes in the season, airing between November 2012 to March 2013 and the season 5 closure rate currently stands at 93%.